Keep your dressing room neat and organized with our dressing room hooks, Chrome 3 inch long Wall Mount Chrome Face out attaches right on to the wall. 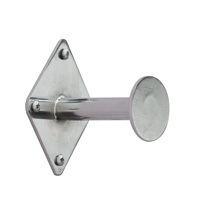 Great for use as a clothes hook in dressing rooms as a clothing hook! Weight capacity depends on surface structure and mounting hardware. Mounting hardware not included.